Chicago, IL - In the spiritual joy of the upcoming feast of the Nativity of Christ, parishioners of Holy Resurrection Serbian Orthodox Cathedral in Chicago filled their Church on Sunday, January 2nd, 2011, to receive a blessing from the Mount Athos monastery of Hilandar, the cradle of Serbian spirituality and place of unceasing prayer for the Serbian people.The Holy Hierarchical Liturgy was celebrated by His Grace Bishop Longin of New Gracanica-Midwestern America, who lovingly facilitated the historic visit of the Most Venerable Archimandrite Methodius, Abbot of the Serbian Imperial Lavra of Hilandar, to this liturgical assembly, together with Hierodeacon Arsenije. Concelebrating with the esteemed guests were V. Rev. Dragoljub Pavichevich, Rev. Darko Spasojevic, Rev. Vasilije Vranic, Protodeacon Milovan Gogic, Protodeacon Damjan Bozic. 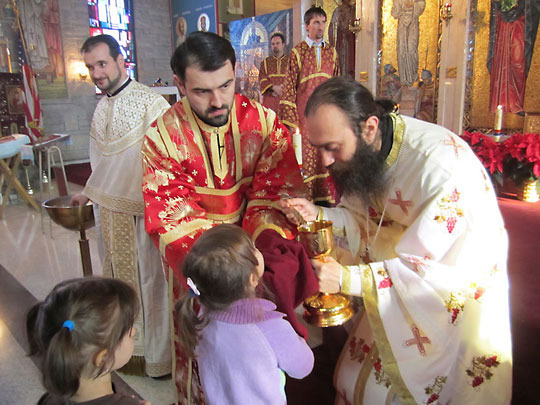 A great number of faithful approached the Holy Chalice of Communion on this celebratory occasion. In a moving sermon, His Grace Bishop Longin interpreted the Gospel reading on the geneology of our Lord Jesus Christ saying that Christ our God, born of the Father before all ages, received human nature through the Most Holy Theotokos and Ever Virgin Mary in order to become more accessible to man, to become the Son of Man, in order to sanctify the just and redeem the sins of mankind. In that way God is ever-present, especially there where He is most needed, because He can sympathize with man and share his travails. His Grace Bishop Longin, the Most Venerable Abbot Methodius, and the Venerable Hierodeacon Arsenius were greeted by Father Darko Spasojevic, Cathedral Dean, on behalf of the Cathedral Clergy and parishioners. His Grace Bishop Longin also swore in the newly elected Executive Board members of the Holy Resurrection Church-School Congregation. Following the Divine Service, hundreds of parishioners approached Abbot Methodius to receive his blessing. Through the benevolence of Milutin and Mira Djordjevic, and assistance of the Circle of Serbian Sister and many volunteers, an agape lunch was served in the Cathedral Hall during which Milivoj Randjic spoke about the meaning of Hilandar monastery to the Serbian people as well as the scope of reconstruction work necessary, while Dr. Milorad Cupic in a moving speech shared his own personal experiences from Hilandar. Biljana Sevic, the president of the Executive Board also welcomed the honorable guests, and asked all present parishioners to help the renovation of the Hilandar monastery. Abbot Methodius addressed the Cathedral parishioners at the end, describing a typical day in Hilandar, and noting that the physical reconstruction of Hilandar only meaningful if it is accompanied by a spiritual revival of the Serbian people, for whom the Hilandar monks pray every day. On this occasion parishioners of Holy Resurrection Serbian Orthodox Cathedral joined in the efforts of the fullness of the Serbian Church to raise money for the reconstruction of Hilandar.